On Thursday 28th at 8pm there will be an evening performance session in the Deptford Town Hall Building. There is no stillness in human movement. Even when simply standing, the body is constantly falling, catching itself, and subtly adapting to the environment. And the experience of this seeming stillness is filled with a myriad of inner bodily sensations that remain unseen to the eye. Micro-movements induced by breath and weight shifts connect us to the force of gravity and an organic flow of embodied rhythms through time. still, moving is a performance for two dancers in which an interactive sound environment responds to subtle changes in muscular activity, disclosing and extending the inner bodily experiences of the performers. 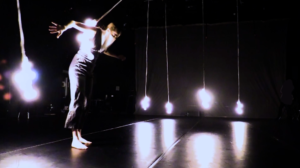 We explore how the sonification of micro-movements can increase or disrupt the performers’ kinesthetic awareness, and how it affects the kinesthetic empathy between the performers and the audience. The performers are equipped with two Myo Armbands that capture physiological signals such as muscle tension and subtle accelerations. The system mediates the relation between movement and sound through interactive machine learning, in a design that evolves over time, in response to the interplay between the performers. This piece is written for MYO armbands, electro-acoustic ensemble and gestural recognition of soundpainting conducting. 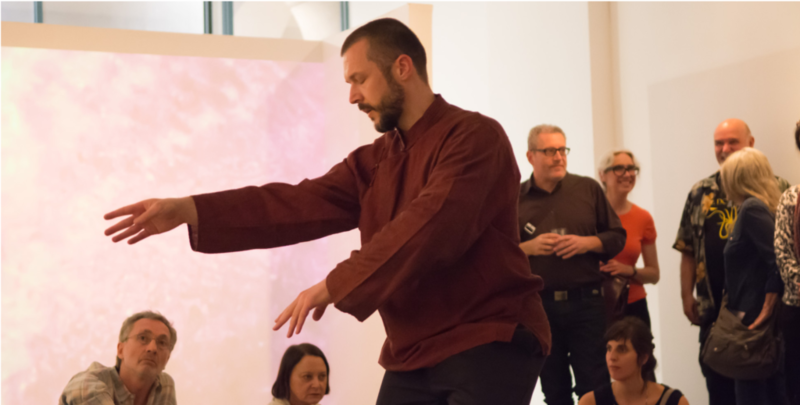 In the piece, soundpainting-inspired gestures guide the performers, as does a graphic/textual score which defines the sonic palette and instrumental gestures available to the players. Tensions are negotiated between acoustic and electronic sources, and between bottom-up structured improvisation and top-down guiding via conducting. These continuums are amplified and explored through another layer of shared articulation: machine learning has been applied to recognition of the composer/conductors gestures, with symbolic recognition opening up channels of electronic processing, which then acts upon the acoustic players at moments in the piece. Continuous mappings between conducted motion and sonic transformations have also been learned, creating a tension between the symbology of conducted instruction and that of continuously co-constructed sound, as the conducting and performer share signals and intentional resonance in performance. This piece was created for my Electro-Acoustic Orchestra (EAO) ensemble at York University, a mixed electronic/acoustic ensemble that is comprised of a combination of York students and Toronto-area professional musicians. The piece was premiered in a concert at my DisPerSion Lab at York U. For this updated version for MOCO, my proposition is to conduct the EAO telematically, who would be performing from my lab in Toronto. For MoCo 2017 I propose to present a live coding performance: WebPage in Three Acts, an assemblage of graphic experiments into a hybrid form of composition, combining principles of choreography with the formal structures of web-coding. As in choreography, web-design also deals with space, time and movement qualities. It has been defining ways of moving, collectively or individually, through fluid nonetheless complex landscapes of information displays, networked spaces, and multimedia environments. The performance being presented and the notion of ‘choreographic coding’ is a technical as much as social, cultural and aesthetic experiment which can be expanded both at the level of web-design as well at the one of choreography. We propose the presentation of 0⏎, a performance that is both a game and an experiment in real-time computer generated performance. 0⏎ uses audio and projection to direct performers in a series of escalating actions and movements determined by the computer during the performance in real-time. Performers attempt–and often fail–to carry out the computer’s instructions, which range from the specific and simple to the complex and figurative but are always new and unexpected. 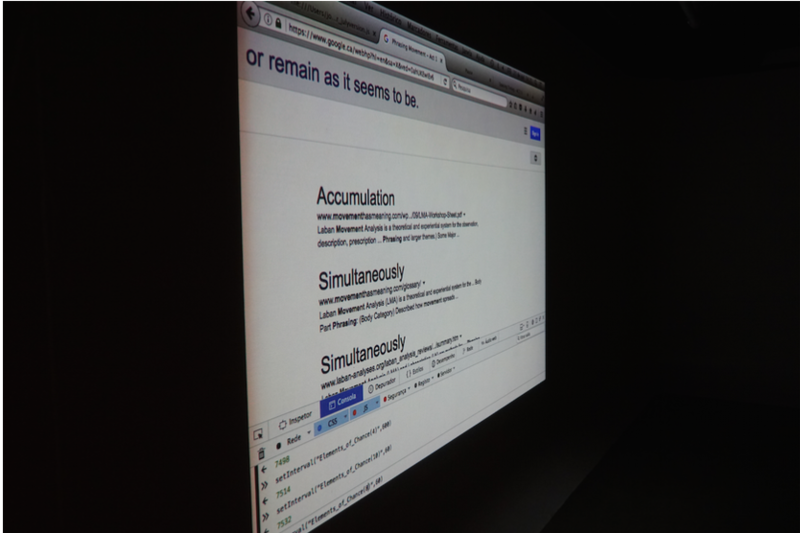 The result is an off-balance, hilarious, and occasionally arresting experience that questions the nature of human/computer relationships and interfaces. As our lives are increasingly governed by algorithms, what do the new structures of power and control look like, and what are the distinctions–if there are any–between human and artificial identity? 0⏎ is performed by a core group of three performers, accompanied by two or three additional performers that are “drafted” from the local community. The new performers rehearse the piece once or twice before the performance but are otherwise left to respond naturally to the computer’s instructions. MOCO’s assistance in identifying the additional performers and securing a rehearsal space would be appreciated, but is not necessary. We would like to present 0⏎ as a forty-five minute to one hour performance. 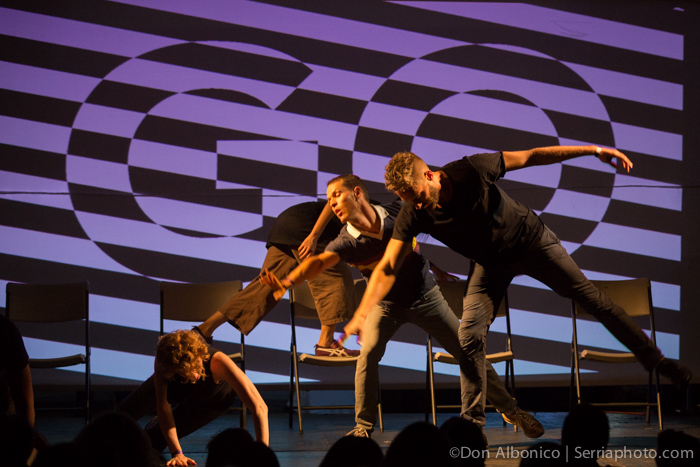 The performance can be staged anywhere from a proscenium stage to a gallery, but it works best when presented in an intimate setting where audience members are free to sit, stand, and move around the space. The performance area must have a projection screen or wall at the back, at least 1.7m x 3m in size. The space must also have a sound system. The projector and sound system are run from a laptop. 0⏎’s performance system is designed for flexibility and portability, so it can be installed quickly and easily and adapted to a variety of presentation formats. Post-performance, we will engage in a brief discussion with audience members who will then be invited to try out the rules of the game for themselves. The piece is inspired by the collaborators’ decades of working with dance and computation: experimenting with sensors, machine learning, computer vision and other emerging technologies and interfaces. 0⏎ interrogates the ethical and cultural issues raised by this work in a bidirectional manner. On the one hand, how does approaching computation from a dance perspective inform our use of technology by problematizing issues that are often overlooked by the scientific and engineering mainstreams? On the other hand, how does approaching dance through computer code influence our choreographic and movement practices? MOCO’s community and topics provide an ideal environment for raising and discussing these questions, and we look forward to the possibility of presenting our work.